Why Didn’t SQL Server Setup my TFS Report Server Automatically? Have you seen this screen? It’s from the installation wizard of SQL Server 2008 R2, but it (or one quite like it) has been part of SQL Server install for a long time. What’s happening here is that you’re being told that SQL Server setup isn’t going to automatically configure the report server you just installed. But it’s not too hard to work around. Once you finish installing the report server, you just have to use one of the management tools SQL Server adds to your Start menu to finish configuring it. And that tool is: Reporting Services Configuration Manager. You’ll want to use it to point your report server to an instance of the Database Engine. The reason SQL Server install didn’t setup Report Services for you is because you didn’t select the Database Engine feature. Report Services is a data driven web site that requires a relational database to function. If you had installed an instance of the Database engine (SQL Server’s own relational database), the SQL installation routine would have used that instance to host the databases required to run the report server’s backend. The Report Services feature you selected in SQL Server is simply the front end of the reporting service. Pointing the front end of a report server to a relational database is not a difficult configuration to manage. You can find instructions here, in the topic for manually installing SQL Server for Team Foundation Server. Typically this happens if you attempt to install the report server on a server different from Team Foundation Server. That’s a completely legitimate and supported way to deploy TFS, but you have to take this additional step to make it work. 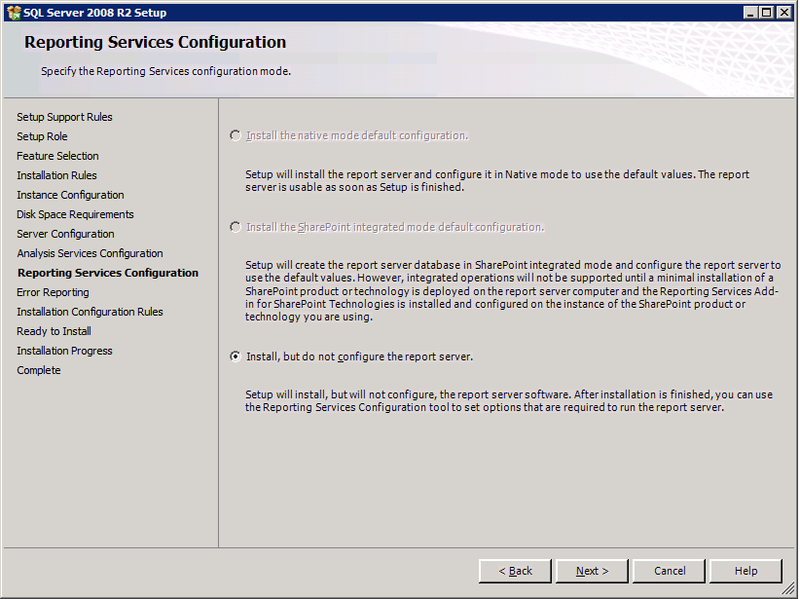 Categories: Tips | Tags: SQL Server installation, SQL Server report server, TFS report server | Permalink.